Solar water heaters photo. The SUN in the sky produces enough energy to provide US with fifty percent of our energy needs. To utilize the benefits of the SUN, we need to orient ourselves on a Southern exposure, a small compromise to bring major improvements. there are limitations you should know about and prepare for before you start. July 24, 2014 both of these collectors reached about the same temperature. 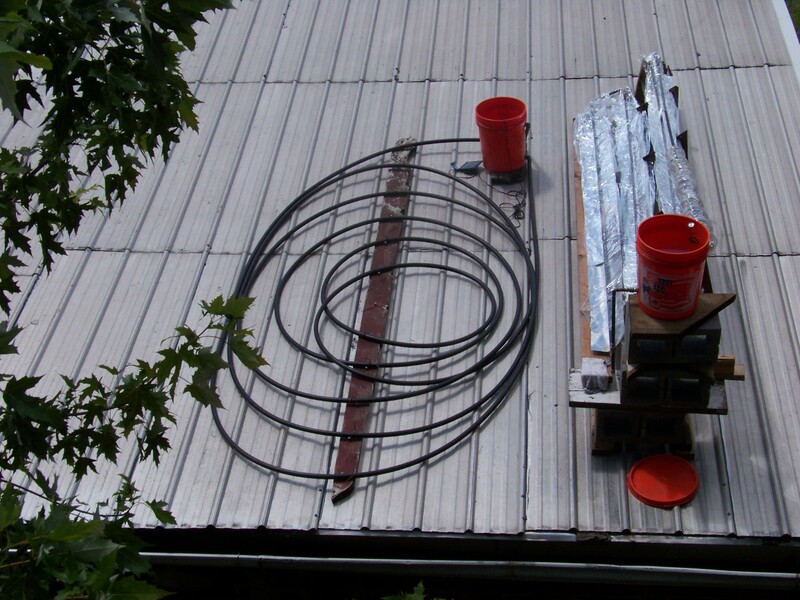 The black coil on the left has a small solar fountain pump and easily rises to about 125 degrees F on a daily basis. The collector on the right is thermo syphon, it requires SUNSHINE to make it circulate. July 24th with mostly sunny skys, the temp reached about 125 degrees F at 2:00 - without a pump. 125 degrees is hot enough for most residential needs and the price is right, FREE !